I know there is a lot of sea glass jewelry out there, but this wrapping technique is super easy and looks very nice. 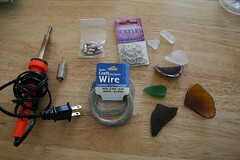 Supplies to make sea glass necklace: craft wire (26 gauge works well) jump rings, clasps (your choice), soldering gun, solder, sea glass of course! 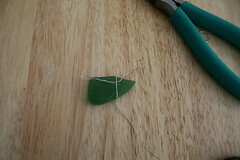 Step 3: Cross the wire over the U shape you just made. 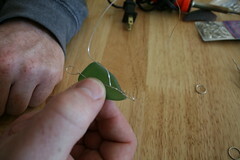 Step 4: Now place the wire on the back of the sea glass with the loop you just created on the side of the sea glass. You will want to do this so that the next loop you create is on the opposite side of the first loop. 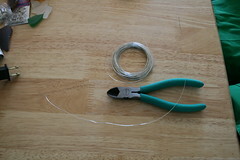 Step 5: Next you will be making the same loop directly across from the first one. Start to create your U shape and twist it several times creating a loop just as you did in Steps 1-4. 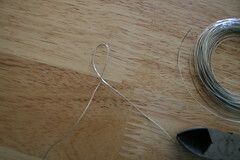 Step 6: Now you have two loops on opposite ends of the same piece of wire and a loose 4-5 inch tail. 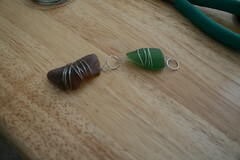 Step 8: First circle around sea glass. Now do that several more times, until you have done several more loops around. The amount of times you go around will depend on how large of a piece you selected. Step 9: After looping it several times the front should look like this. Sort of tidy and neat. The back is where the two side loops are. 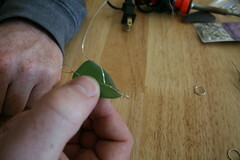 Step 10: Now open your jump rings and attach them to each side loop. 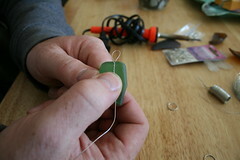 Step 11 Open your jump ring and attach it to the side loop of the next piece of sea glass you are using. Keep attaching pieces until you reach the desired length, soldering each piece is you so choose, to add strength to the jump rings. 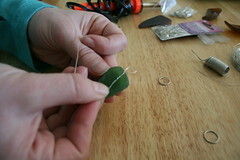 Step 12: Attach your clasp to the ends. Now go get some sea glass! Pretty! Thanks for sharing this tutorial! This is beautiful. Are you selling this or keeping it for yourself? I always look for sea glass, but never am lucky enough to find any. Great instructions! Your technique is so professional and the finished project is so pretty! I tagged you, if you're interested in playing! Found this through the Craftzine blog and wow! My son & I have been collecting pieces of sea glass from Monterey, CA for the last few years and have a jar full. This will be a great summer project! Thank you! 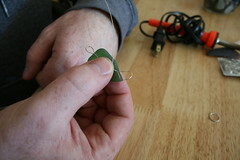 Question though....when do you Solder? great job girl!i live on the santa fe river in florida & i do the same with river rocks.hope to see more of your work. Wow! 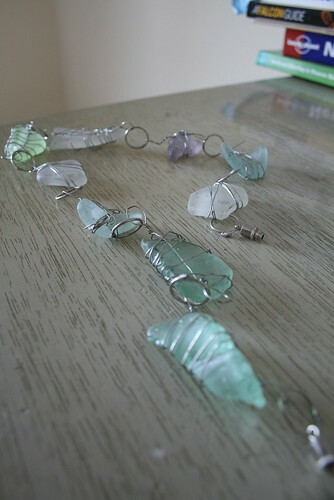 I love sea glass and this is LOVELY! What a beautiful necklace. 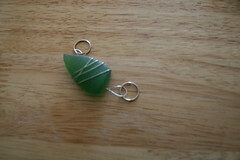 I have recently created a social network for Sea Glass Artists & Sea Glass Colectors. I hope you will join u Betty! We have the largest online community dedicated to Sea Glass Lovers around the world and feature groups such as Locations to collect sea glass, Ideas and Crafts, Displaying your sea glass, photos and much more. http://www.seaglasslovers.ning.com to become a member of the largest online community for sea glass collecting in the world! If you love sea glass, you may be interested in joining the Internets largest private online community dedicated to Sea Glass Lovers around the world. Members share over 4000 sea glass photos, beach locations, craft and display ideas, great finds, and much more. Online chat with other members around the world. After only 4 months online we have 1000 members in over 24 countries. Note: this is NOT a jewelry site or have affiliation with any other sea glass group but is made up of members sharing love of collecting sea glass. 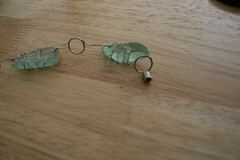 Post your beautiful sea glass crafts and photos at Odyssey Sea Glass, the world's most viewed sea glass site. We'd love to see your contribution! Totally cool! 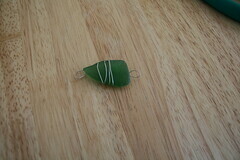 Most people would only wrap one but your linked sea glass creation is lovely. Will link in a future blog post. I would love to learn this craft. I have only been collecting sea glass since last July and have mostly yellow, seafoam green and frosted white. 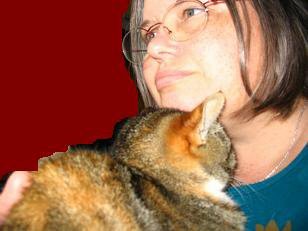 I am hoping to make a tree ornament for my three sisters and my daughter for Christmas but dont know where to begin. Being a ninja is all about being crafty. You’ll find it all here- quilts, sewing, crafting. Long live Musashi and long live the Betty Ninja.